In Medieval and Renaissance Europe, reliquaries were created to house a relic, usually a body part of a saint. Many cultures have a version of this; Buddhist stupas hold the bones of lamas and rempoches, Greek tombs held vials of blood, even the Egyptian pyramids are a form of reliquary. The relics are recognized as sacred and honored as such. I am fascinated with the idea of Geomancy (literally “foresight by earth”), an ancient belief system that assumes the earth holds an immense tome of wisdom. Scientists interpret geologic samples like rocks, plant matter and ice cores to understand our past and predict our future – much like priests and shamans have done for millennia. Metaphorically, these samples are sacred objects offering us a deeper insight into the physical world. I visited the Mt Waddington Ice Core field camp in British Columbia in 2010 (read about that journey here). That experience, as well as journeys to Antarctica and other Northwest glaciers, Inspired me to create an immersive art installation that captures a sense of the scale and frailty of these environments as well as visually convey some of the insights this science is yielding. I built the Mt Waddington Reliquary as a permanent record of this research and as a study for developing the exponentially larger WAIS Divide Reliquary. I fabricated the relics as a visiting artist in the ISOLAB at the University of Washington. 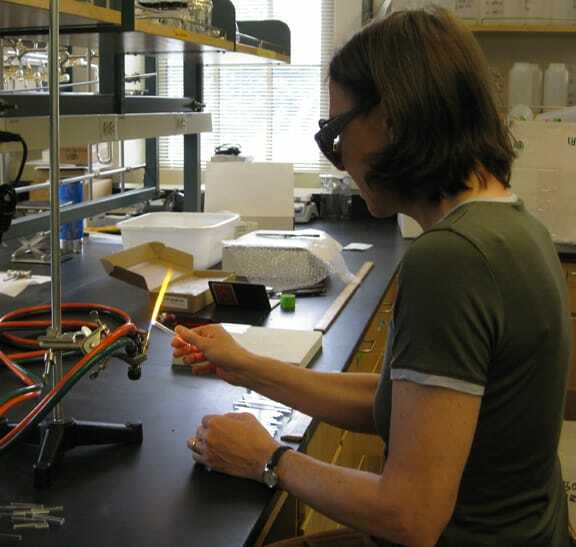 They offered access to small samples of water from the ice cores that are left over after isotope testing. It has been invaluable to have their input and support on this project. The “relics” are really ampules, made from lab glass tubing, cut and sealed, containing 0.20ml of water from each meter of the ice cores. There are 142 ampules corresponding to the 142 meters of ice drilled. 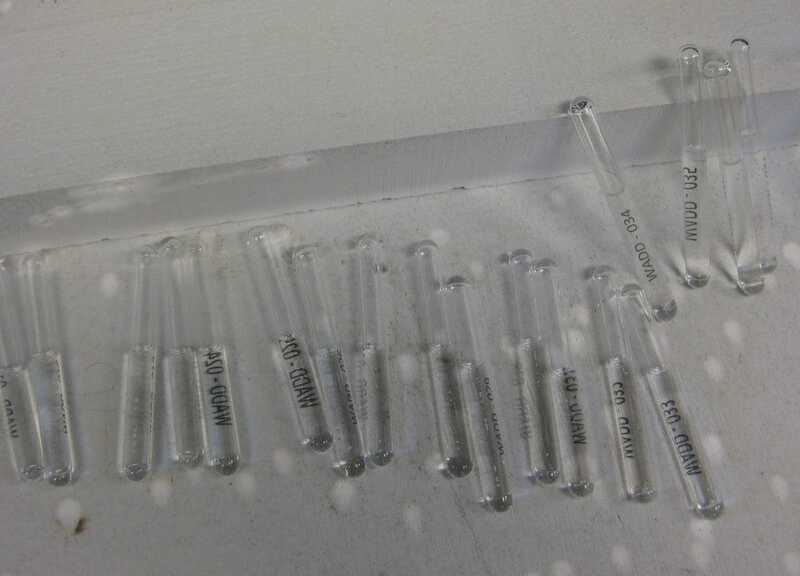 I made each tube by first cutting lab glass into short lengths, sealing one end and firing them in a kiln to bake on the numbers. 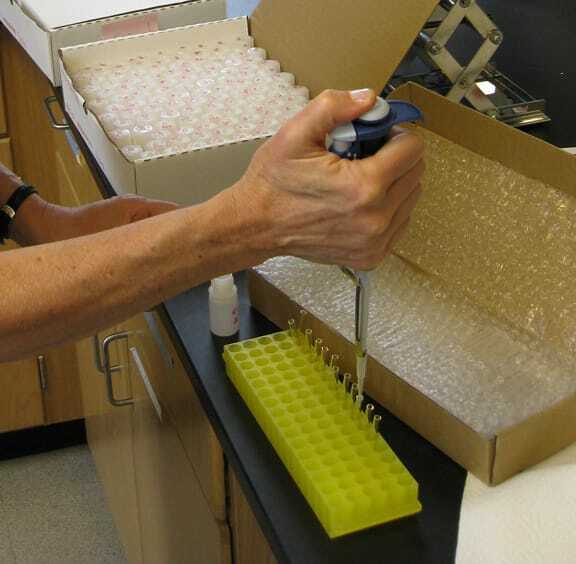 Each tube was then filled with a small sample of water from each meter of the core. 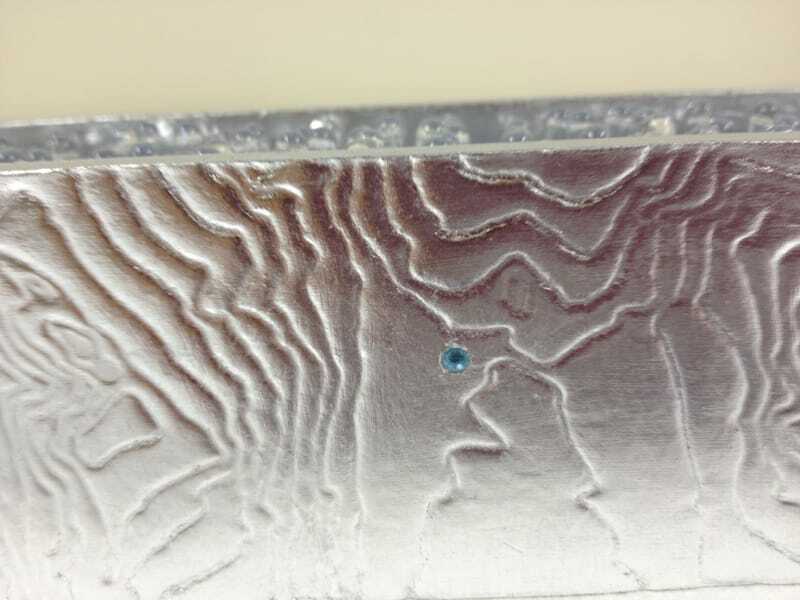 This water is left over after analysis takes place. Even so, I carefully followed lab procedures to eliminate the possibility of cross contamination that could alter the isotope ratios. 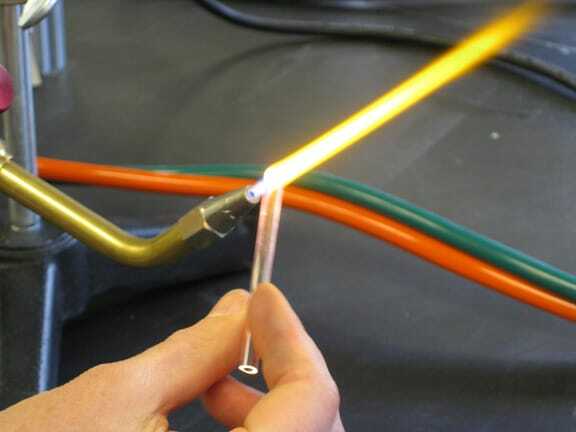 Finally, I melted the open end with an oxygen/gas torch. There was a bit of a learning curve to properly seal the tubes, but I eventually figured out a process to completely seal the ampules. The Mt Waddington ampules are contained within a reliquary that I made with bookbinding board, silver leaf and a small topaz to mark the drill site. 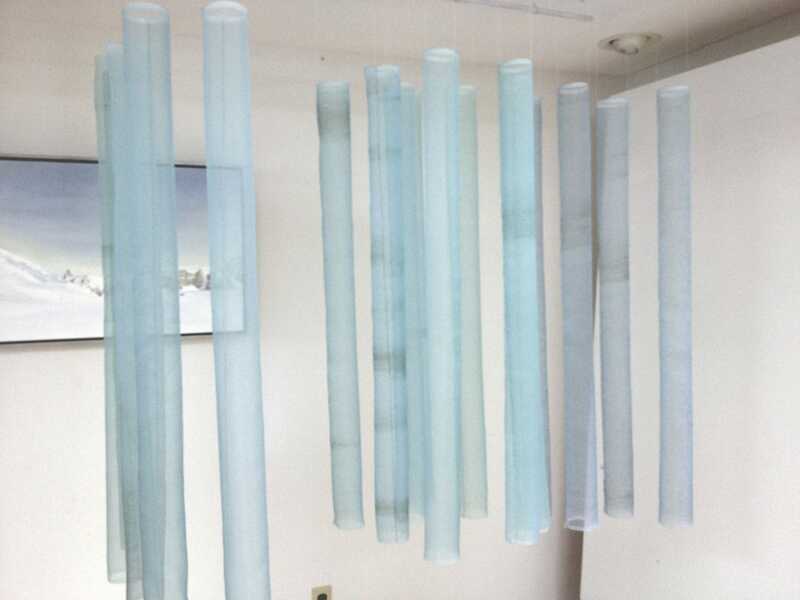 I also made 142 silk organza “ice core” tubes that will hang at eye level to define a large circle, creating a sanctuary for the reliquary. Each tube is ten centimeters in diameter by one meter long that I printed with a high resolution scan of one of the core sections. They are a full scale model of the entire Mt Waddington Ice Core. 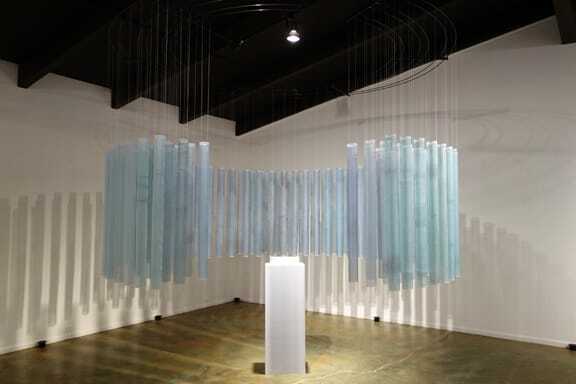 detail of several “core’s” hanging in studio – in process. I am excited to announce that the first installation of this sculpure will be at Francine Seders Gallery, opening this October 11, 2013, until November 2, 2013. 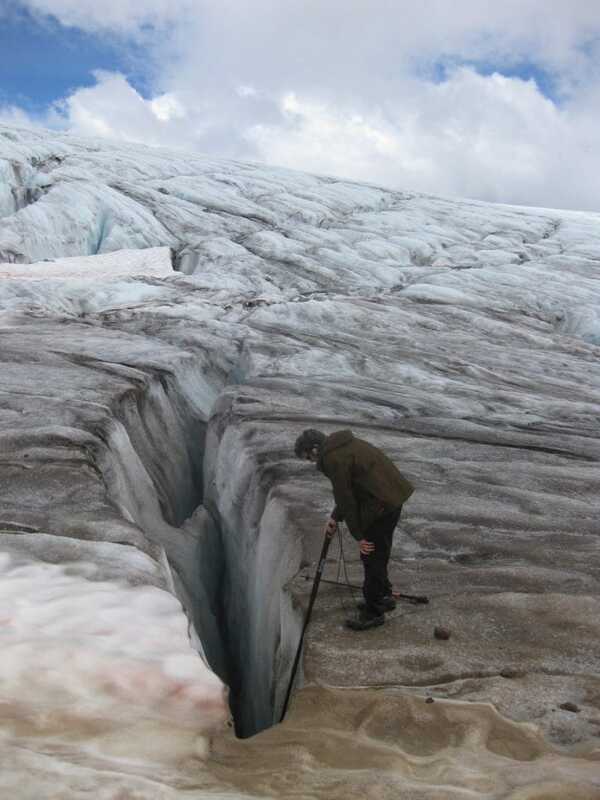 Sound Artist Steve Peters has made a beautiful 8 channel sound piece using recordings that he made during a hike to the Easton Glacier on Mt Baker. Special thanks to Peter Neff; Eric Steig; Andy Schauer and Kyle Samek at the ISOLAB; and Angel St Teresa, who interned with me in 2012 and assisted me in printing and finishing the organza tubes. I very much enjoyed seeing your piece and having the serendipitous opportunity to chat with you about it. I am drawn to fiber installations and my favorites are those who are able to connect to the earth around us. Water is my favorite of the elements and so was immediately drawn to your piece. In experiencing your installation I was captivated by the imagery and sound. The sense of sacred space evoked a profound experience for me. Thank you so much for the experience. Good luck with your further explorations.